Do you want to plan a bicycle tour in the nearby wood? Need driving instructions to get to an address in a foreign city? Besides searching for places, Marble can now display possible routes between two or more of them. And the best thing is: The routes are draggable! Places to travel along can be entered using search terms (e.g. addresses) in the new Routing tab on the left. Of course Marble also allows you to input them directly on the map. Routes are retrieved using OpenRouteService and displayed on the map. Turn-by-turn instructions are displayed on the left. You can customize the route using preferences like transport type (car, bicycle, foot). An arbitrary number of via points can be added easily: Use either search terms or create stopovers quickly and conveniently by dragging them out of the existing route and dropping them at the desired position. 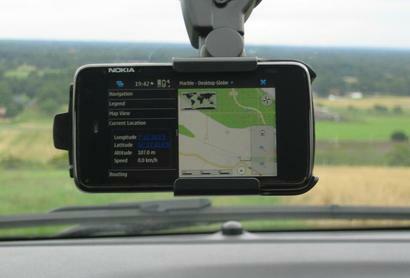 While a real-time navigation mode is scheduled for Marble 0.11, you can already export the route in the GPX format now. This feature is handy for using routes in conjunction with your navigation device or other software. For normal usage, Marble downloads the map data that is needed on the fly in the background. It also saves the data that has been downloaded on the hard disc. Now imagine that you make a trip to Norway, and you don't know for sure whether you'll have internet during the trip. So you want to download the whole Oslo area in advance. Up to now this hasn't been possible. 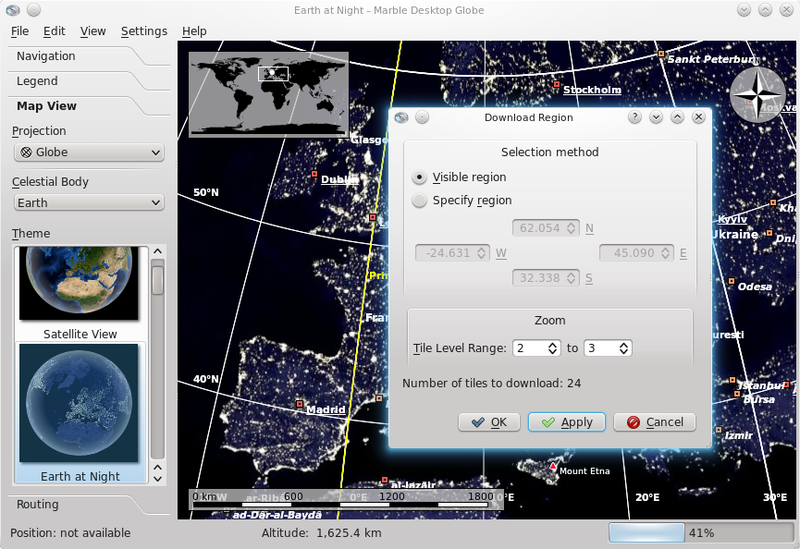 But with Marble 0.10.0 you can click "File->Download Region ..." and you get a dialog where you can specify the region and the zoom levels that you want to download. This feature was brought to you by Jens-Michael Hoffmann. For this release, Jens-Michal Hoffmann has worked on Multiple Layer support. 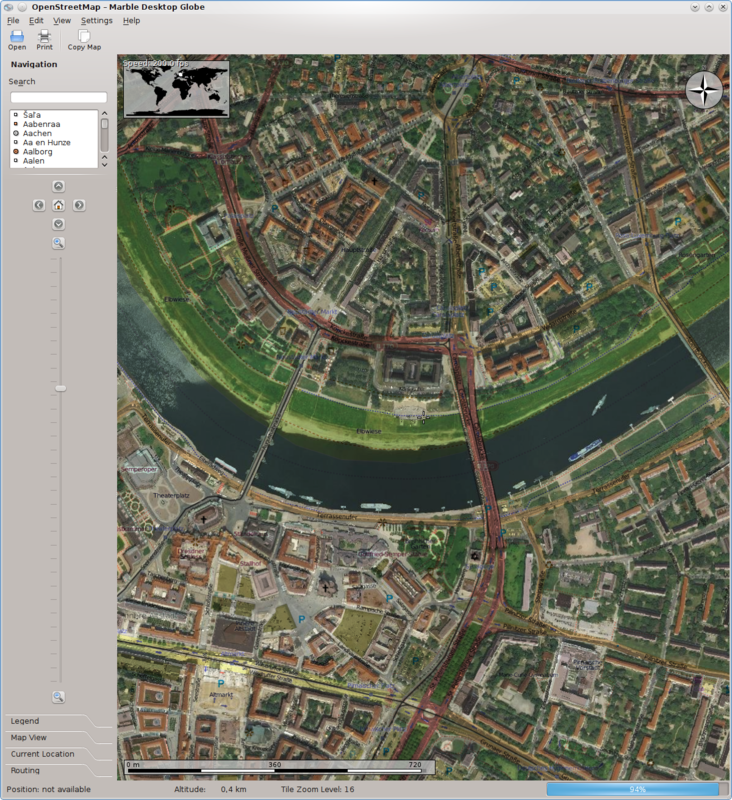 This means that maps can now be created which display multiple texture layers. For instance: a cloud layer on top of a street texture layer on top of a satellite texture layer. This is all done in a generic way. So people who create maps for Marble can create an arbitrary amount of layers blended on top of each other. The best thing is: Due to the way the feature was implemented the performance doesn't change! And the clouds feature has been reworked to make use of the new mechanism. The City of Dresden shown in Marble with multiple layers: Satellite images provided via WMS displayed on top of OpenStreetMap data via Multiply Blending. on top of each other using Gimp-style "filters": You can choose among more than 30 blending algorithms, such as: Overlay, ColorBurn, Darken, Divide,Multiply, HardLight, ColorDodge, Lighten, Screen, SoftLight and VividLight. If you've ever use an application like Photoshop (TM), Krita or Gimp then you probably know what this means. Quick and Dirty WMS Support and More Url Download Schemes. Lots of map data is provided on the internet on servers via the Web Map Service ("WMS") protocol. Bernhard Beschow has added initial quick and dirty WMS support to Marble. This means that there are now a huge number of maps that can be easily displayed using Marble. With KDE 4.5, we have completed the first step toward mobile platform support: Marble will show a slightly different and simplified UI on the N900 Maemo platform compared to the desktop. For KDE 4.6 we aim for an even better user experience and improved performance. For more information please visit the Marble Garage Project. Next stop will be the MeeGo version for Marble. Wes Hardaker shows worldwide Ham-Radio stations. HAM Radio's APRS program allows radio transmitters to send their position and other information and is frequently used in disaster relief efforts for coordinating team distribution. We are still looking for programmers who would like to create more Online-Plugins: e.g. Twitter, News, Earthquakes or a social network plugin. It's easy to do and there's an Online Service Plugin tutorial available on our website that shows how to do it. Point is .... does marble work with proxy? I have tried setting proxy server both in marble's configuration as well as KDE's global proxy settings. Nothing seems to work. No routing either. Maybe not the place to say this but KDE should now aim to get office and/or proxy friendly. All corporate environments use some sort of proxy server! I guess this would make your proxy work. And we need to fix this in Marble (again) indeed. Update: I've just committed a fix which would stop suggesting "http://" for trunk and Marble 0.10.0 release. sorry, looks like i posted my reply as a new comment: in short, yes that worked but can't get routing working yet (Australia). 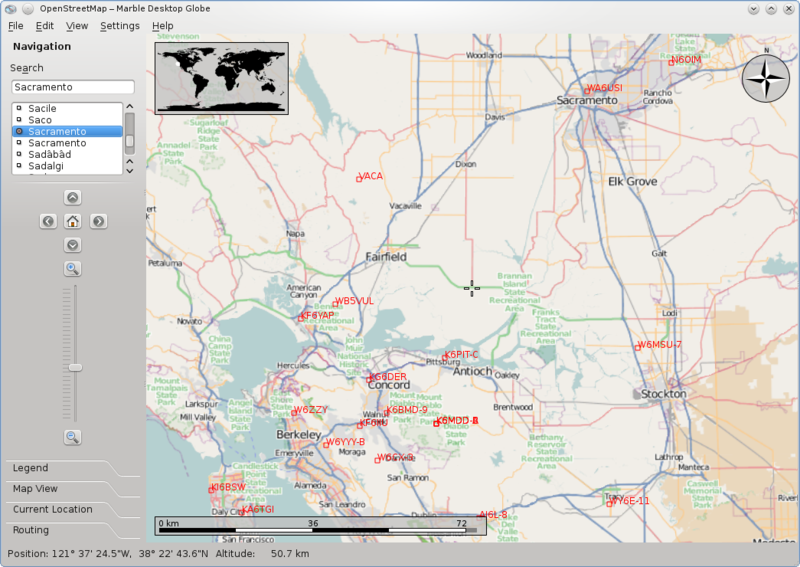 Talking about your WMS's implementation, did your team had a look to qgis ? It's in Qt, it's GPL, it has a lib, a c++ and python api and support WMS-C, WFS, etc. Thanks for your suggestion. We know about QGIS. The fact that some application is opensource often enough doesn't help much with creating the same feature in a different application since the interna are usually very different. In the case of QGIS the license is even different (GPL vs. LGPL) which wouldn't allow us to transfer code without permission for a license change to LGPL. Yes, that worked. 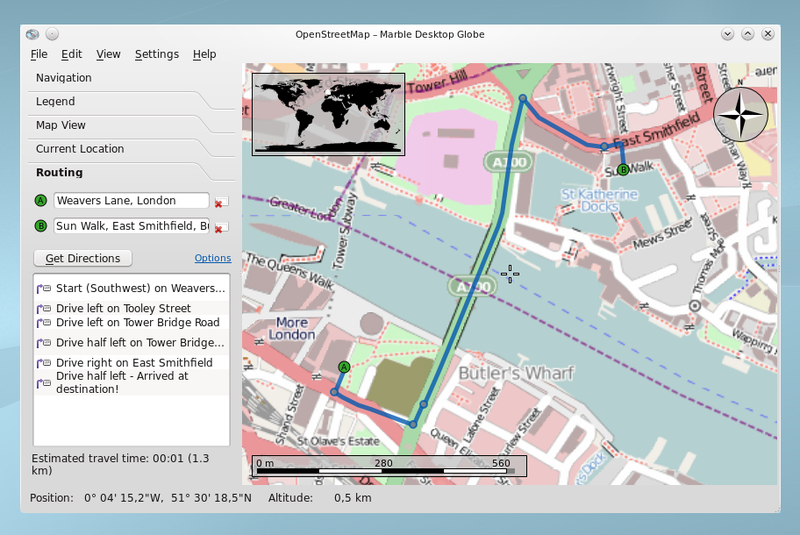 I can see the openstreetmap view now. Thank you. Routing is still an issue though. I am in Australia. Has routing support been added for this region yet?